As technology progresses many of the things that were once commonplace become obsolete. Practically everything will eventually meet this fate; typewriters, cassette players, VCRs and public pay phones are all examples. The same is true for the incandescent light bulbs. The world has two leading technologies positioned to take the place of the incandescent bulb; they are the light emitting diode (LEDs) and the compact fluorescent lamp (CFLs). In this article, our goal is to explain these emerging technologies so that you can make a better decision when choosing between the two. The incandescent light bulb is becoming obsolete because it is extremely inefficient, especially when compared to a light emitting diode or a CFL bulb. Incandescent bulbs are very simple devices. Each one contains a filament, which allows electricity to pass through. This process converts electricity into heat, which causes the light bulb filament to glow white-hot creating light. Most of the electricity that is used to light up incandescent bulbs is wasted on the heat that it produces. As a result, many countries around the world have implemented some type of incandescent light bulb ban, which bars retailers from selling them. This has influenced both businesses and homeowners to choose from alternative light sources when living life in the green zone. As the name implies a compact fluorescent bulb is just a miniature version of a fluorescent light. Due to the fall of incandescent light bulbs, these fluorescent fixtures are now being used in many homes and business across the globe. A CFL bulb works by driving electrical current through a tube containing mercury vapor and argon. This produces invisible ultraviolet light, which excites the phosphor coating of the lamp. Phosphor is a synthetic material that emits visible light when it is exposed to ultraviolet radiation. Because of their design, CFL light bulbs use one-fifth to one-third of the electricity it takes to generate the same amount of light use a comparable incandescent bulb. They also last eight to fifteen times longer, averaging about 12,000 hours per bulb making them much more energy efficient. That is why so many manufactures advertise these fixtures as energy-saving light bulbs. Despite the fact that this type of light bulb has been around since the early 20th century, it took nearly 100 years for manufactures to develop the spiral shaped bulb that is popular today. Since the first helical CFL bulbs became commercially available in 1995 their popularity has steadily increased year after year. However, like most things in the world, CFL light bulbs come with advantages and disadvantages. We will take the time to discus some here. According to the US Department of Energy, CFL light bulbs on average use 75% less electricity and last ten times longer than the average incandescent bulb. Since the 1990’s bulbs have been widely available in many stores throughout the world and price continues to fall. On average they cost in-between $3 and $4 per bulb. Each CFL bulb can reduce your homes greenhouse gas emissions by several hundred pounds over the course of its lifetime. While they are slight more expensive than incandescent bulbs, they are often considerably cheaper than light emitting diode fixtures. 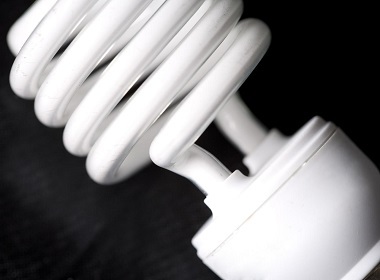 Because CFLs are so much more complex than incandescent bulbs they are prone to more errors. This can lead to some CFL bulbs not lasting as long as others even if they’re in the same batch. Research has shown that lower grade CFLs are much more susceptible to dimming than higher quality bulbs. This means you should be careful when choosing your fixtures if you’d prefer them to keep their brightness for many years. These bulbs contain mercury which is a toxic metal that can be harmful to both humans and the environment if the proper waste management techniques are not employed during disposal. Because of their design, they usually take a certain amount of time to warm-up to full brightness. This length of time depends on the manufacture; it can range from as little as 30 seconds to as much as three minutes. Light emitting diodes are considered by futurist to be the light source of the 21st century and beyond. This is because unlike incandescent or compact fluorescent bulbs, they don’t rely on filaments or toxic vapors to produce light. Instead they utilize semiconductor technology, which is very similar to the technology found in computers, smart phones and other electronic devices we use today. Compared to compact fluorescent and incandescent bulbs, light emitting diode technology is fairly new. General Electric developed the first LEDs, which produced visible light, in the 1960s. In the beginning LEDs were no more efficient than incandescent bulbs. However, since the turn of the millennium many companies and government agencies across the world have offered incentives to people who come up with ideas to improve the efficiency of this technology. Since 2008 the cost of LED bulbs has fallen by over 80% and the fixtures available on the market today are six to seven times more energy efficient than standard incandescent lights. Along with this increased efficiency comes a much longer lifespan as some LED lamps can get over 50,000 hours of use. Just as we did with CFL lights, we must take the time to discus both the pros and cons of LEDs. Some LEDs are capable of outputting 135 lumens/watt making them much more efficient than incandescent bulbs which average 15 lumens/watt. Unlike CFL bulbs LEDs reach full brightness instantaneously as opposed to having to go through a warm-up period. LEDs are much more environmental friendly, not only due to efficiency, but also because they don’t contain any potentially hazardous material such as mercury. Because light emitting diodes are based on some of the same fundamental technology that is found in computer chips, they are highly controllable. Depending on the manufacture, the color and brightness for each bulb can be changed at will. Perhaps the main disadvantage of LEDs is their cost. Because the technology is fairly young the initial cost to transition from conventional lighting to LEDs is much more than switching to CFLs. 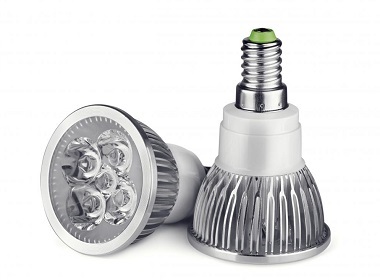 As manufactures develop new methods to make LED bulbs the cost is sure to drop considerably. A great analogy is the mobile phone. In 1983, the first commercially available cell phone cost $4000. Today cell phones start as cheap as $20. Another disadvantage is that LEDs are directional. For example, this means if you placed one in a table lamp you’d likely get a single beam of light instead of light that radiates throughout the entire room. However, LED manufactures are aware of this and are currently developing ways to defuse the light properly so that it acts more like conventional light bulbs.